Lignite fired power station renews its flue gas desulphurization system and converts its existing chimney to a PennguardTM lined wet stack. 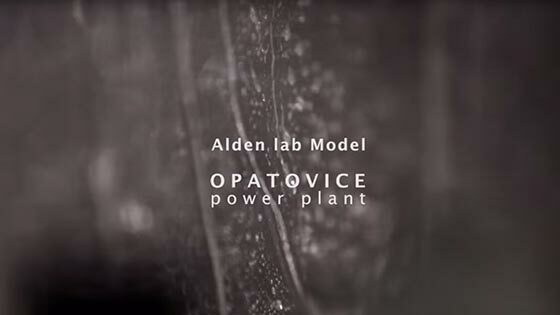 The Opatovice Power Plant is located between the cities of Hradec Králové and Pardubice in the Czech Republic. The plant has 6 units with a combined generating capacity of 330 MWe and 650 MWt. Through its 310 km long district heating network, the Opatovice Power Plant provides heating and warm water to over 60.000 households in its region. 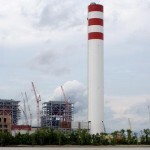 The power plant has operated with a flue gas desulphurization (FGD) system since 1998, but in 2012 the plant’s owner, EP Energy, decided to completely renew the FGD to prepare for meeting stricter SO₂ emission limits in years to come. The new FGD system also uses wet limestone technology and it has a 97.5% SO₂ removal efficiency. 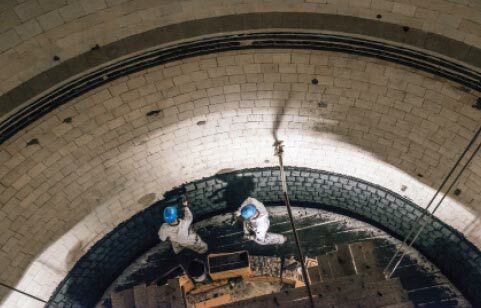 The old FGD system, which had been running since 1998, had a rotary gas-to-gas reheater (“GGH”), which raised the temperature of the flue gas going into the chimney to 92°C. 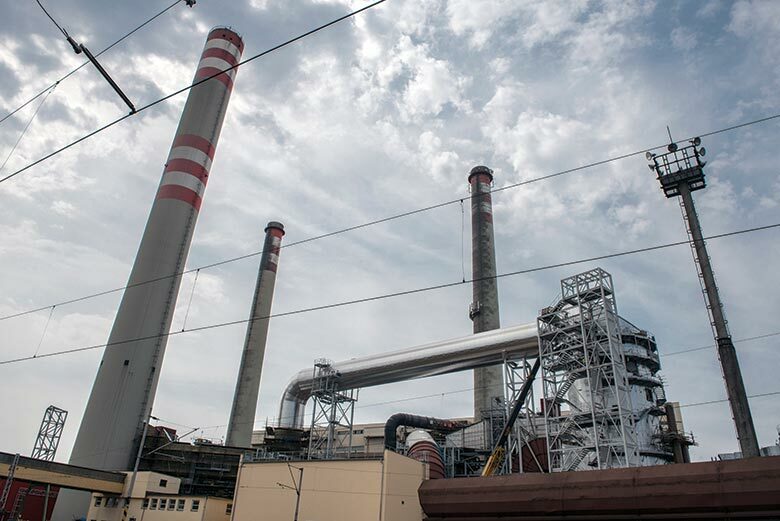 With its new FGD system, the Opatovice Power Plant aimed for maximum efficiency and one important decision was to avoid any reheat and to change over to FGD wet stack operation. The existing chimney of the Opatovice Power Plant was a 135 m high, reinforced concrete chimney with a sectional ceramic brick flue. 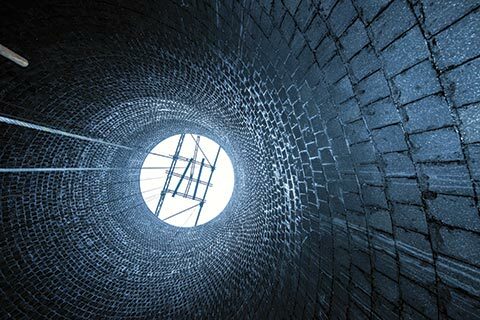 Ceramic brick flues are typically permeable to flue gas condensate and the owner concluded that the chimney, although in good condition, could not be used for FGD wet stack operation. Building a new chimney especially for the FGD wet stack operation would be very expensive, and so it was decided to convert the existing chimney for the new operating conditions by installing a PennguardTM lining directly onto the surface of the ceramic brick flue. All of the chimney modification works, including the installation of 3,446 m² of the PennguardTM lining system, were performed by Czech chimney construction specialists Omega Teplotechna in the months of June, July and August 2015. 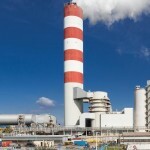 When a power station changes over to non-reheated FGD wet stack operation, it is very important to consider the risk of “spitting”, which is the emission of droplets of acidic condensate from the top of the chimney. 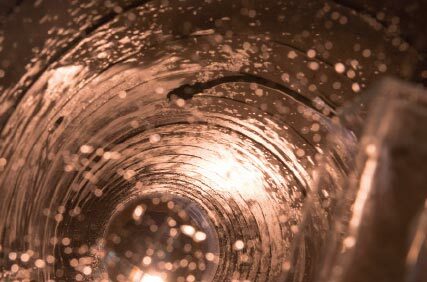 This risk, and possible remedies, can be investigated through a Wet Stack Design Study, which models the behavior of droplets in the outlet ducts and chimney downstream of the FGD system. 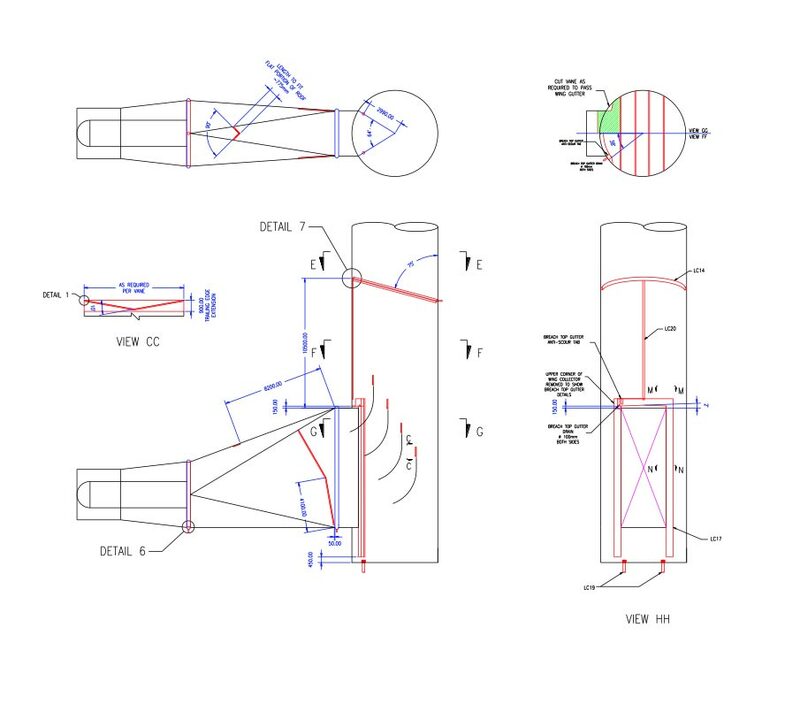 For the Opatovice project, a Wet Stack Design Study was performed by Alden Research Laboratory, a recognized group of experts who have performed a number of these studies in recent years. As a first step, Alden looked closely at the design drawings and the operating parameters for the new FGD system. One of the most important elements of operating an FGD system without reheat, and with a wet stack, is flue gas velocity. 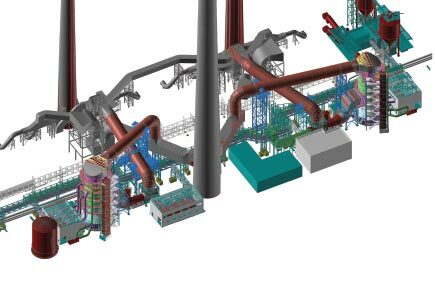 Based on their pre-study, Alden designed and constructed a 1:15 scale model of the FGD outlet ducts and the lower portion of the chimney. Wherever possible, the model was built in plexi-glass to allow Alden’s technicians a good view of the processes on the inside. Once completed, the model was connected to air fans and water injectors and run at the correct air velocity, to see the expected behavior of condensate flows in the specific geometry of the Opatovice duct system. Even though Alden use computer modeling extensively for much of their work, it is more efficient to replicate the behavior of liquid film flows in wet ducts and chimneys using physical models. 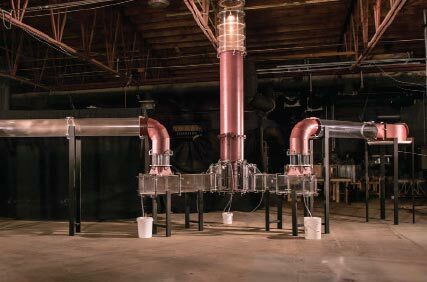 Based on their observations running the model, Alden designed the liquid collectors and drains that would most effectively remove the liquid flows from the FGD system before they could reach the chimney and create a “spitting” problem. The condensate film in a wet stack must drain to the bottom and, based on that, many designers have long assumed that the inside surface of a wet stack should be very smooth. Tests have proven that this is not always true. Alden Research Laboratory, who have performed the Opatovice Wet Stack Design Study, have through the years performed tests on a number of different materials that are used in FGD wet stacks. For each of these materials, Alden built a test model and determined the maximum flue gas velocity at which a condensate film could still reliably drain without reentrainment of acidic droplets back into the flue gas stream. 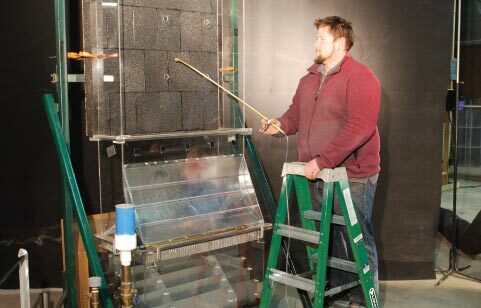 In their test observations, Alden’s technicians found that the textured surface of PennguardTM Block helped the PennguardTM lining to maintain full contact with the condensate film. This allowed a PennguardTM lined wet stack to be run at slightly higher velocities than chimney (flues) constructed from other materials. 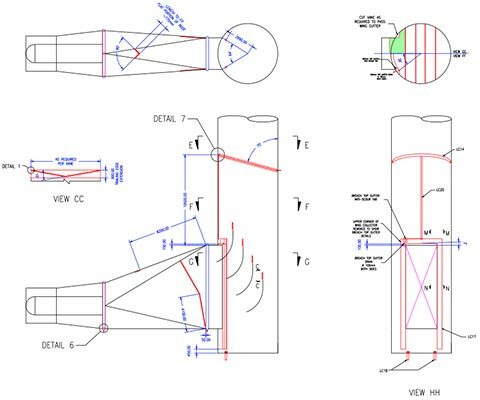 The recommended maximum gas flow velocity for PennguardTM lined wet stacks is 18.3 m/s. 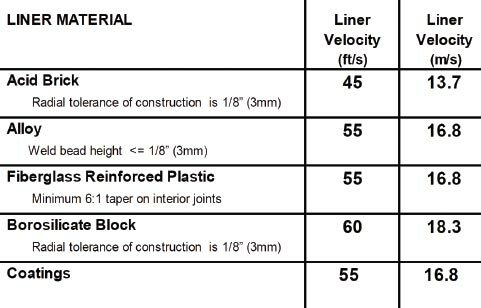 In its Revised Wet Stack Design Guide published in December 2012, the Electric Power Research Institute (“EPRI”) confirms these recommendations and lists a higher recommended gas flow velocity for PennguardTM (“borosilicate”) lined wet stacks, compared to wet stacks constructed from other materials.